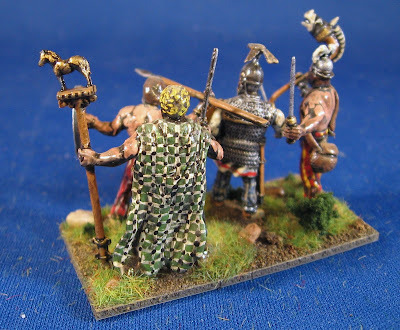 I've been putting aside boxes of the new 28mm plastics as I've come across deals and whatnot. 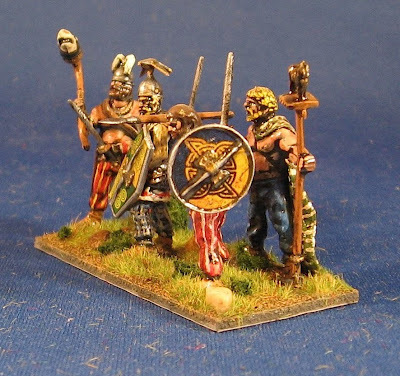 I'm not sure why I've been doing this, but I finally pulled open the 28mm Wargames Factory Celt warband box. 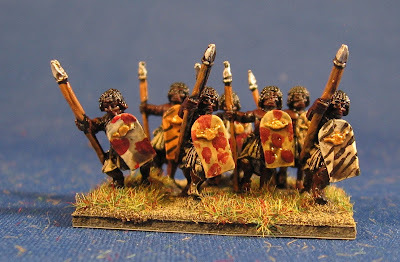 After some fiddling and doing nose counts, I think I'm going to build two 28mm armies for DBA: a Marian Roman army (with a few extra bases to morph it into Polybian Romans), and an Ancient British army (with a few extra bases to to morph it into a Gallic army). 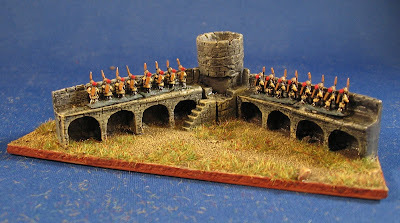 To test the waters, I put together a 4Wb General base for the British. The figures went together fairly well, although I can see it will take me some time to get realistic poses. 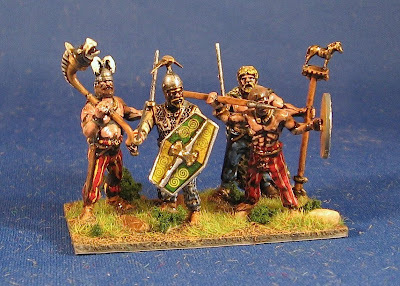 I can also see I'll need to think a bit about the poses for the Romans if I want to get four on a base. I left the shields off until the very end and this helped me nest the figures together better. I also ended up extending the base by 10mm in depth (thanks to Tim and Joe for their helpful comments). I did a quick build. Quick is perhaps a bit misleading as these took a fair bit more time than a comparable set of metals would. But the variety of poses that are possible is staggering to consider, especially with some mixing and matching. I'm keen to improve my modeling skills so I opened a tube of putty and added a huge pouch to one of the guys at the back. He and the fellow with the cape are the same basic body (one of the least adaptable poses, in my opinion) but some different fittings, heads and a bit of putty make each one unique. And then I got more ambitious and added a cape to the other fellow. A damned thick and warm cape as it turned out! Live and learn. Anyhow, this was successful enough that the second set of figures I've built (two 3Wb) also have a variety of capes, cowls, and sacks. I also spent some time carving up a figure (with much trepidation) to make an archer who has just released his arrow (not shown). That turned out fairly well so I think I will continue to experiment some more. Up next: Probably the two 3Wb bases will roll off the production line this weekend. I'm in no rush to build these so I might go a bit slow and enjoy the process. I will likely also turn my attention to the 15mm Anglo-Irish army that is staring longingly at me from the prep table ("paint us! paint us!"). I think this might be my contribution to the EWG auction but I think I will try to sell it online in in lieu of at the club as there will be a couple of other DBA armies on the block at the club. Dave dropped by today for combination playdate and DBA-fest. 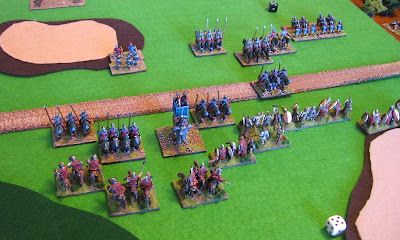 He brought his Persians and I I hauled out my Normans and we had three games (2:1 for the Normans). 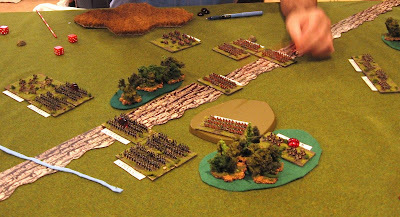 The first game I set up the terrain (open field--no brainer there) and Dave had a tough slog against my knights. You can see below that I have shoved through his line on the right and am about to do the same on the left. He tried to envelope my general in the middle but some cheesey bow-fire to the flank won this one for me. Game one to the good guys. 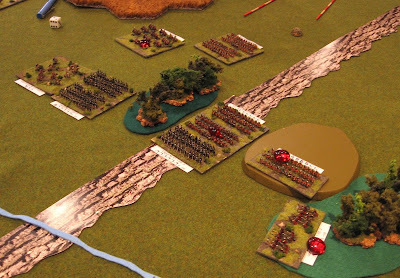 In game two I again controlled the terrain and put down a river. As it turned out, it ran perpendicular to the game play and neither of us tried to cross it. I think this game was decided on a general-kill (although I could be wrong) in favour of the Normans. In game three, Dave set up a total hash of a board and then got caught splitting his force. 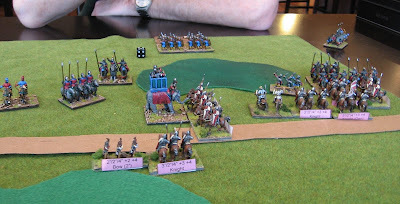 Bad pips allowed me to bottle up the cavalry on the right but I could not handle his damned elephant. I'm pretty sure his general died in this game, but he had enough of an edge that he fought on and quick-killed a bunch of knights with his elephant. In fact, I think everything I lost in this game I lost to the damned elephant. All told a good day and nice to see Dave pull game three out of the fire. It was truly awful right from the terrain set-up! 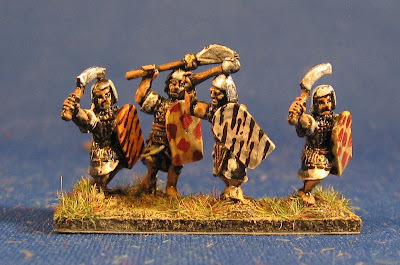 Up next: I have some 15mm Anglo-Irish on the painting table and also have been fooling around with 28mm plastic celts. We'll see which interest me most tomorrow! We had 10 guys in my basement this afternoon participating in an eight-empire campaign. The overall winner was Dave C, followed by Terry S. Chris and Mark. 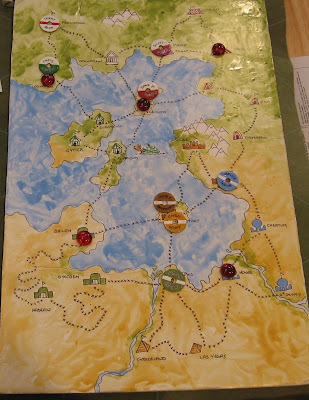 Also playing were Bruce, Ian, Chen, Scott and Dave P. The game board was this modified wagon wheel. The game started with Dave P and Scott duking it out for the Macedonian city of Delphi. 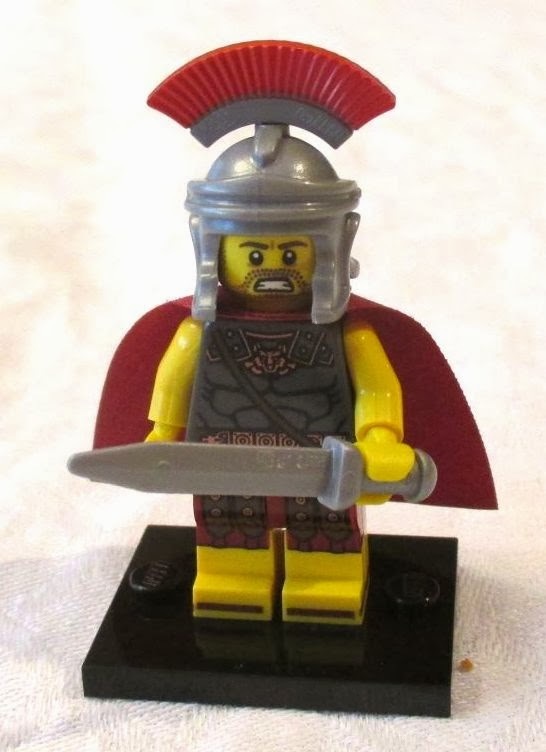 Dave managed to lambast the Macedonians, seizing the city and setting the tone for Scott's day. 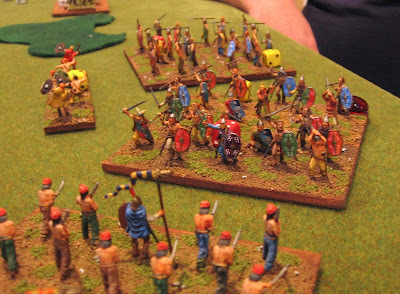 The summer saw two more battles, with the Egyptians wailing on the Indians and the Romans losing the battle to the Celts but coming out ahead on points. We ended the year with Mark W and Dave C squaring off for the first of a series of battles. 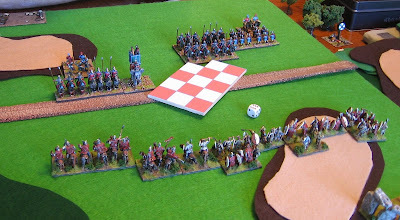 Dave's strategy appeared to be to intimidate other players into avoiding his army and this largely worked for him, allowing him to collect Mark as a vassal early on and the range far away from his homeland at the end of the game. The broken armies of Scott and Terry also had a poke at one another in the north. Year two saw another dust up with Dave C. and Mark as a result of which Mark became Dave's vassal. Dave then quickly returned to fight Chen while his minion... errr... vassal beseiged Chen's retreat path. The Badassyrians beat the hell out of the Egyptians. This drove Chen back towards Mark's army which also gave him a pasting. In the meantime, Chris drove north and managed to sack the Roman capitol with Terry's army inside, thereby gaining his own vassal. This brought us to year three. Mark chased Chen to his capitol, capturing it and gaining his own vassal. Chen and Mark then combined forces to fight off an Indian army attempting to seize Las Vegas. 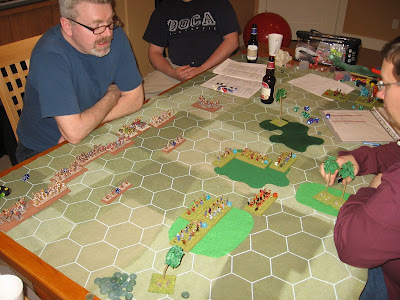 In the north, Scott, and Terry threw in with Christ to trap Dave P and then fight him in Scott's capital, bring their three armies (well, one army and two partial wrecks) against Dave. Dave struck boldly but lost a key battle and then was slowly whittled down as the the remaining allies entered the board. And thus ends an enjoyable day (7 hours) of gaming. Thanks to everyone who attended and to Mark and Dave for providing all of the armies. 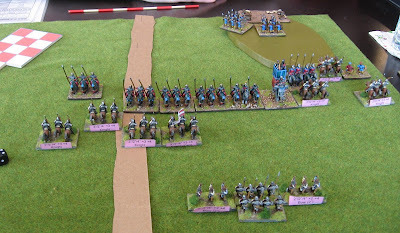 Up next: Perhaps some 15mm Anglo-Irish and then maybe onto trying some of the 28mm plastics I have been socking away. 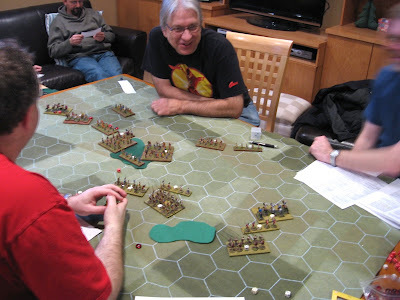 Following ritualistic sacrifices to the Gods (i.e., having my in-laws over to Christmas dinner), my wife consented to a games day with eight guys from the Edmonton Wargame Group. Our plan is to have a three- (or four-) year campaign with eight players tomorrow. 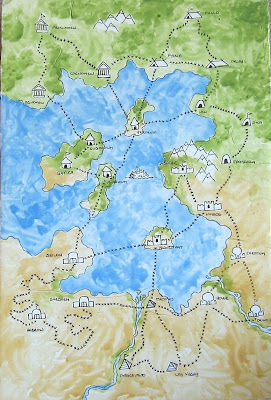 There will be map moves using rules derived from Tim Brown's various HoTT campaigns with tabletop battles resolved using Dave's and Mark's 1/72 armies and Basic Impetus. Now on to making up move forms, finding army counters, buying beer, etc. 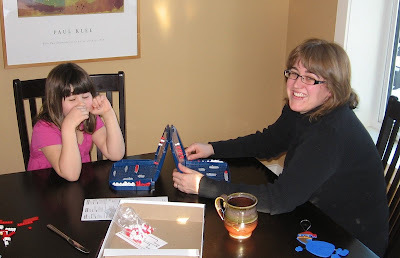 In the category of Christmas miracles, I emerged from the basement on Boxing Day to find my wife and daughter playing a wargame. Now, admittedly it was Battleship, which is mechanically defective (no CnC, no morale mechanics, ahistorical fleet deployment, simplistic combat system) but it is a step in the right direction! There is also an interesting variant in the rules called Salvo! which allows a bit fast resolution by using a more realistic combat mechanic and step-reduction in fire power. It is not Victory at Sea or Flat Top, but getting there! 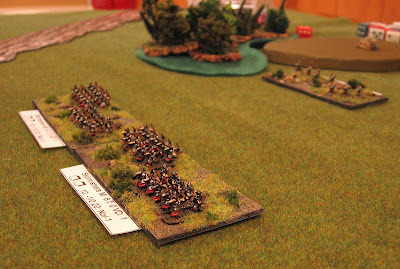 Up next: A campaign report and maybe some 15mm Anglo-Irish. I have two painted DBA armies that I would like to sell. 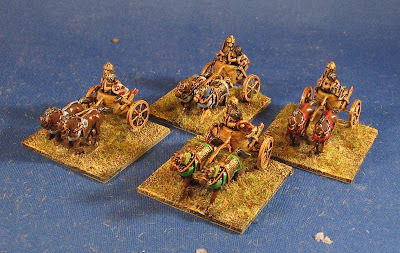 The first is a 15mm New Kingdom Egyptian (I/22 a and b) all option army that also morphs into an Early Egyptian (I/2 a and b) army. It comprises four bases of 4LCh, four bases of 4Bd, three bases of 3Bd, five bases of 4Bw and one base of 3Bw, one base of 3Wb, two bases of 2Ps, one base of 7Hd and a camp with a pyramid. Full pictures are available on my blog here. 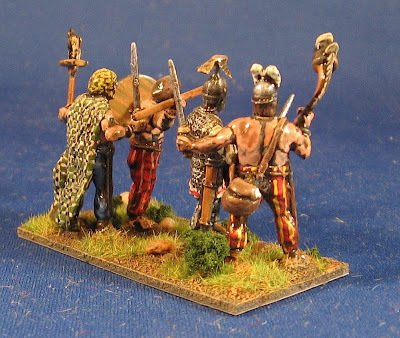 All foot are Old Glory and all mounted are Falcon Miniatures. All are hand painted by me over a black undercoat and then sealed. Home is pet- and smoke-free. 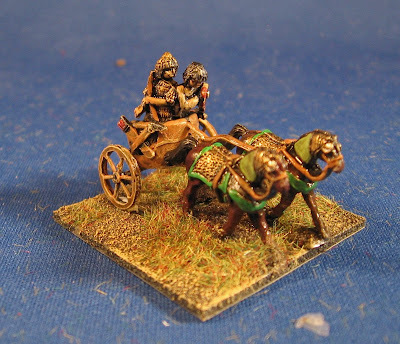 The second is a 15mm Hittite. 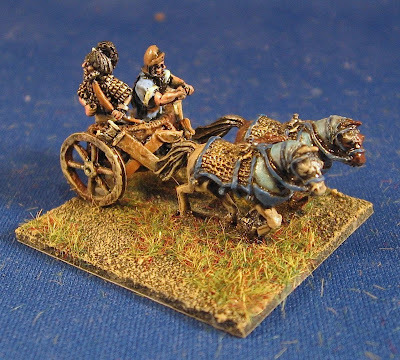 It comprises four bases of chariots (switching between HCh and LCh depending on the army list), nine bases of 3Sp, two bases of 2Ps and one base of 7Hd. This is a slightly smaller but easier to use army than the NKEs. It is also an excellent enemy for them. Full pictures are available on my blog here. 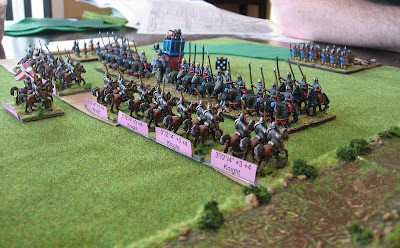 The camp is pictured below, is 6mm and is perhaps the best camp I have ever done. All foot and chariots are Old Glory. All are hand painted by me over a black undercoat and then sealed. Home is pet- and smoke-free. I'd like $65 for each of these armies (that includes postage to the US or Canada with insurance and tracking number). If you buy both, I will throw in a copy of the hardback Praeger reprint of Osprey's Qadesh 1300 BC clash between the Hittites and the NKEs. Questions or offers to bob.barnetson@shaw.ca . 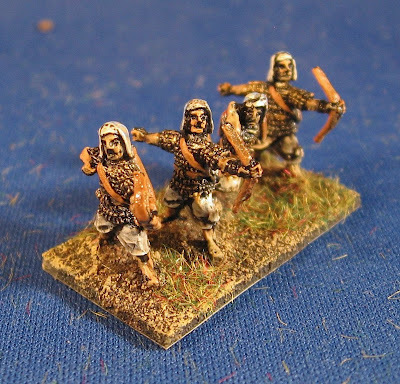 This afternoon I finished up a 15mm New Kingdom Egyptian army for DBA (I/22) There are also enough elements to allow it to morph into an Early Egyptian army (I/2). Both armies are all option armies. The army starts with 4 LCh, one of which is the General. 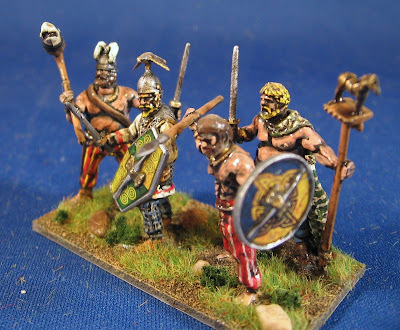 These are by Falcon Miniatures and are comparable to Old Glory. There is also a 4Bd foot general for the Early Egyptian army. All of the foot figures in this army are by Old Glory. There are some 62 foot figures on 17 bases. There are five bases of 4Bw and 1 base of 3Bw. There are three bases of 4Bd, three bases of 3Bd and one base of 3Wb. There two bases of 2Ps for support. 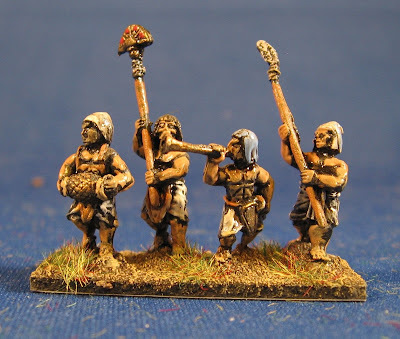 And finally one base of 7Hd done up as allied tribesmen. 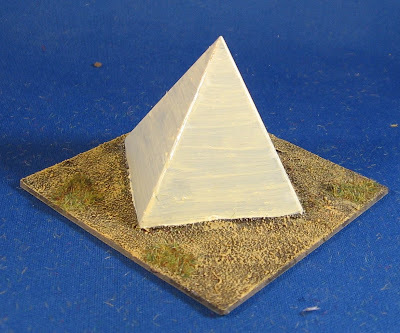 I also put together a camp (80x80mm) based on a pyramid. 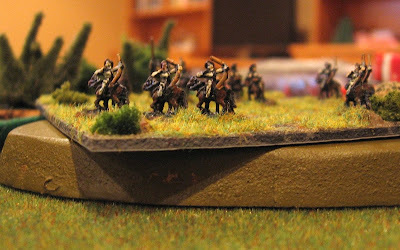 And I put together a 120mmx80mm camp for the Hittites I did last week. 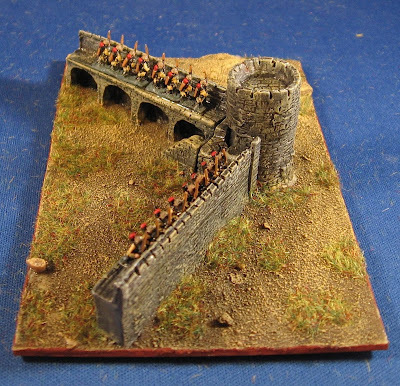 This includes a corner of a 6mm Irregular fortress and some 6mm Baccus troops painted up to man the walls. Thanks to the guys at Fanaticus for their help with this. 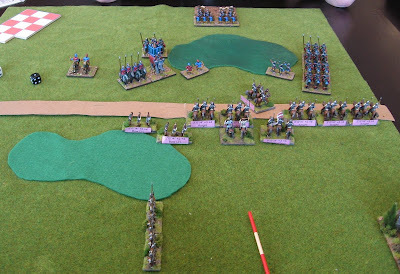 Up next: I have a 15mm Anglo-Irish army on paint sticks, but I expect that I will be busy with family and an all-day tourney I'm running on the 28th. 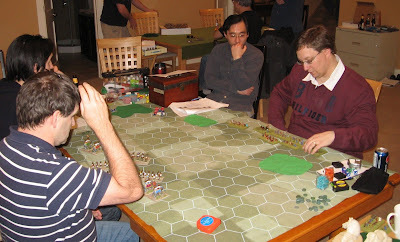 I dropped over to Dave's house after work today for a bit of DBA action (my 50th day with gaming this year). We played two games. The second game was quite quick--his Hittites beat the hell out of my New Kingdom Egyptians. I'd like a rematch at some point now that I have a better sense of how they work. We also compared Hittite armies. Our painting styles have diverged: same figures, Dave's on the left and very bright; mine on the right and very dark. 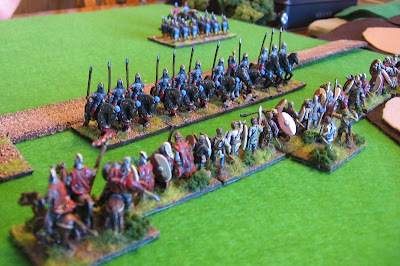 The first DBA game we played put his Sassanids against my Roman-Brits. 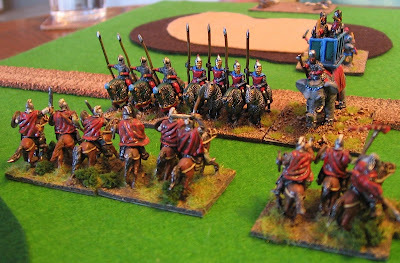 Lots of cavalry against lots of spears with an elephant and King Arthur thrown in for good measure. Kind of a proto-crusade match-up that I would try again. The board was pretty crowded at the beginning of the game. The line advanced. Here is the left side of the board. And here is the right. Combat proved fairly inconclusive. What developed was a long-term mess like this. I kept pushing him back but could never quite seal the deal and kill him. Eventually, Dave started to get an advantage on the left side of the picture. I pushed hard in the middle, knocking back his cavalry with the plan being to turn my spear and close the door on his elephant. Unfortunately, I lost my general on a 6-1 fight against his elephant (arse!) and that brought the game to a close. Up next: Pictures of my NKE army and camp. 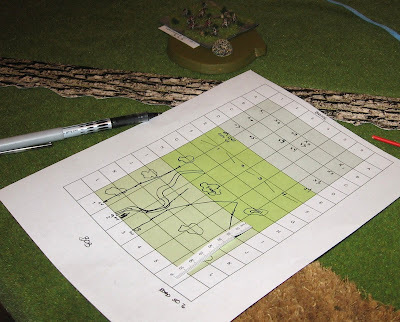 I agreed to host a game at MayDay this year involving a combination of map movement and miniatures play (the latter determining the timing of the troop arrivals on the former). 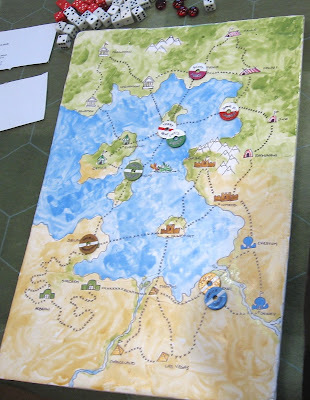 Bruce agreed to come over to playtest one approach to this that was in Battlegames 20. I set up a basic Rome-on-Rome game with all troops moving first on the map and then arriving on board. The pre-game proceed fairly well, but I think an area-movement approach would work better in a convention setting. It also better simulates the offboard traffic control issues of the battle I'm trying to model. 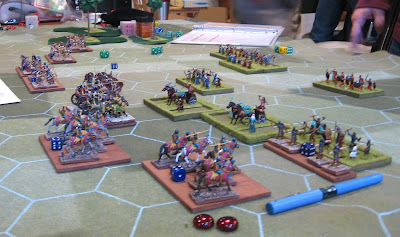 Below, you can see my cheeky light horse units occupying one of Bruce's outpost hexes. Then the heavies finally showed up, nicely modeling the staggered way in which armies appear in battle--the fast vanguard followed by the core. Below you can see my legion have come down the stairs, wheeled left and stand ready to attack. Below we see the legions about to clash in the middle of some dodgy terrain. Bruce is advancing from the top of the picture and I surged forward, hoping to pick off the unit on the hill. Damned thing held out for at least three turns of pounding! 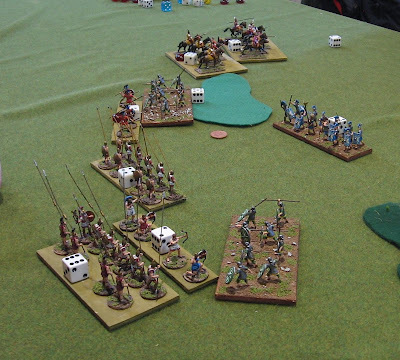 Here is a shot of Bruce's bowmen about to grease some light infantry. Apparently his units got issued with laser sights and depleted-uranium arrows. Good lord, what didn't they kill! Another picture of Bruce's annoying bowmen! And here is the end game, with Bruce's legion on the hill having held off my advance until he could bring a flanking unit around to finish me off. Overall a fun game using Basic Impetus. Bruce completely outplayed me the entire game and broke my forces. Afterwards, I recalled that we never did examine the actual victory conditions (which had something to do with setting up a picket line). Oh well! I learned a lot for my MayDay game and I will start to work through some of what we talked about afterwards. Definitely area movement is the better mechanic, but the map made for an interesting pre-game. This could be extended by adding in a couple of waves of troops. 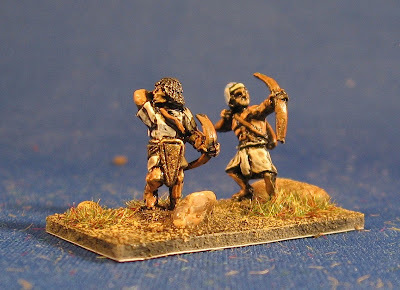 Up next: 15mm New Kingdom Egyptians are on painting table along with camps for both them and their Hittite opponents. I'm not sure what will come next. I need to rebase some 6mm troops (AWI) for MayDay.